Service improvement is not simply about optimizing customer satisfaction or maximizing profits. The real point is to avoid stagnation: If we don't move with the times, we'll be left behind. In this video Stefan Kempter explains how the Deming Cycle has found its way into the most popular service management frameworks and standards, and how the continual service improvement process works in YaSM. 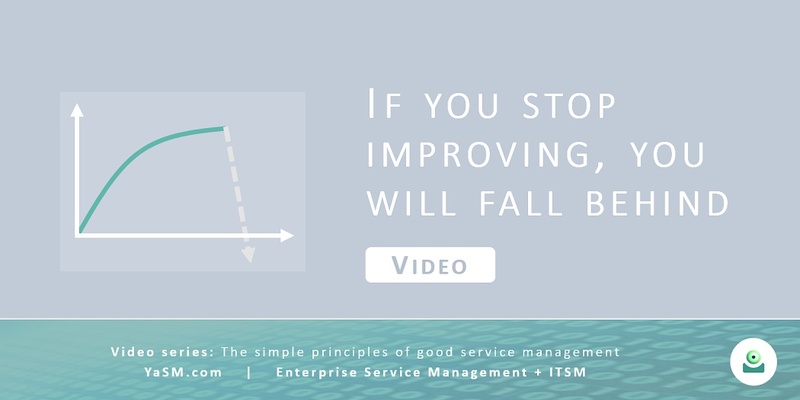 This is video number three in our series about "the simple principles of good service management - and how to apply them in practice": There have always been a number of time-tested, simple principles in service management that we must get right in order to become successful providers of services. In our videos we explain how you can bring these principles to bear in your organization. Part 3: If you stop improving, you will fall behind. - Continual service improvement (on this page). To learn more about YaSM's continual improvement process and the YaSM service lifecycle please visit the free YaSM Wiki. The first two videos in our mini-series about good service management were about customer focus and service definitions. Today I'd like to tell you about the importance of continual service improvement. Getting better is not simply about, say, optimizing customer satisfaction or maximizing profits. The real point - in my view - is to avoid stagnation. The world around us is changing all the time, and we have to ask ourselves on a regular basis if we are doing a good job or if there is is anything that could be done in a different, better way. It's a bit like in sports: New sorts of equipment or training methods become available, and if we don't move with the times like everybody else we'll be left behind. Of course the idea of continual improvement was not invented specifically for managing services. In fact, it has a long history and many of you will have heard of a well-established management method for continual improvement, known as the ®Deming Cycle® with four steps: Plan, Do, Check, and Act. At times this is also referred to as the ®PDCA cycle®. from where the PDCA cycle starts again. Over the years the PDCA cycle has found its way also into the most popular service management frameworks and standards. ISO 20000, for example, specifically requires the application of the Plan-Do-Check-Act methodology. And it also refers to a similar concept inspired by the PDCA cycle called the ®service lifecycle®. If you are familiar with ITIL®, the most widely used service management framework, you will know that the same service lifecycle concept also figures very prominently in ITIL®. And what's more, in COBIT® we find a concept that is roughly made up of six steps called ®Plan, Build, Run, Monitor, Evaluate and Direct®, so here we have yet another kind of PDCA cycle. Clearly, all these PDCA cycles and lifecycles in different incarnations share the same principles of continual improvement, and since this kind of thinking has become common wisdom and is widely accepted, we also apply it in YaSM. In particular, YaSM has a service lifecycle like the one in ISO 20000 and ITIL®, so if you know these frameworks and standards it will not be too difficult for you to understand how continual service improvement works in YaSM. Arguably all these processes in the lifecycle play a role in continual improvement, but most of the actual improvement activities take place around the service improvement process. First of all, service improvement needs some inputs to be able to verify if the services are delivered as expected. These inputs are produced in service operation in the form of service quality reports. The service quality reports typically contain statistics and evaluations, as in this example a comparison of the promised versus the actual response times for answering customer inquiries. The service improvement process will analyze the statistics and other information and summarize its findings in a service review report. If it turns out, say, that the actual response times are often longer than promised, it will make sense to take corrective action and start an improvement initiative that is managed through the service improvement plan or SIP. The SIP is also a valuable input for the strategic process, where we think about service improvements on a bigger scale. So this is how continual improvement works at a high level of detail. The YaSM® Process Map, in particular, contains detailed descriptions of the activities that should be performed and the documents to be produced. and monitoring service improvement initiatives. If we go into the service review process and look into the top area with the process inputs and outputs, we can spot the service quality reports coming in from service operation, as expected. and - if appropriate - holding customer meetings. Once these activities are complete, we compile a service review report which is a key input for the subsequent definition of service improvement initiatives and a number of other YaSM processes, such as the strategic process. and from analyzing any customer surveys. With these templates it shouldn't be too difficult for you to get started with reviewing and improving the services in your organization. So we can give you a lot of advice about continually improving your services - but you still have to apply that advice in your organization. Service improvement is a kind of task that needs to be done over and over again and it's always a bit in danger of being forgotten if there is something more urgent to do. But service improvement definitely has lots of benefits, and making it a routine is probably the best way to ensure it doesn't get forgotten. Thanks for watching, and as always, if you have any questions we are happy to answer them in the YaSM community.